Students can track their power and water use in real time, and see how they stack up against others. K-12 and college students are increasingly conscientious about their carbon footprint, and are part of the greenest generations yet. These students are learning from sustainable education facilities that “speak” to them. New technologies that allow for real-time tracking of energy and water usage, called “green dashboards,” are on the rise in classrooms, schools and residence halls across the country. Designers are incorporating these tools into their design programs to allow both clients and end users, such as students and teachers, to track water, gas and electricity usage in the buildings they design. And because green dashboards provide real-time data about energy and resource usage, they allow building tenants the opportunity to see how they can modify their behavior to decrease their environmental footprint. The system is similar to how the dashboard of a hybrid vehicle shows drivers how their driving habits affect that vehicle’s efficiency. Information displayed on green dashboards is being used to inform classroom curriculums. At the Secondary Academy of Success in the Northshore School District, students analyze the dashboard numbers and compare the data to previous months and years. Students check their energy and water use at a dashboard kiosk at the Secondary Academy for Success in Bothell. It’s part of the school’s commitment to reduce its ecological footprint. It’s also the perfect companion to the school’s comprehensive approach to achieve sustainability, which includes design features like occupancy sensors, skylights, solar panels and wind-powered generators. Since the building opened in 2011, the school has been locally and nationally recognized for its innovative sustainability programs. This year it was the winner of the Polished Apple Award given by CEFPI, the Council of Educational Facility Planners International. The dashboards are also becoming part of the college campus. Students at Central Washington University’s Barto Hall can monitor utility use and track the number of plastic bottles saved when they fill up their reusable water bottle at a dashboard-enhanced drinking fountain. The dashboard system itself does not guarantee energy and resource savings. Instead, the dashboards need to be used in partnership with user groups, and user groups need to buy into using the dashboards to help influence their behavior. There are two things that can foster this buy-in. 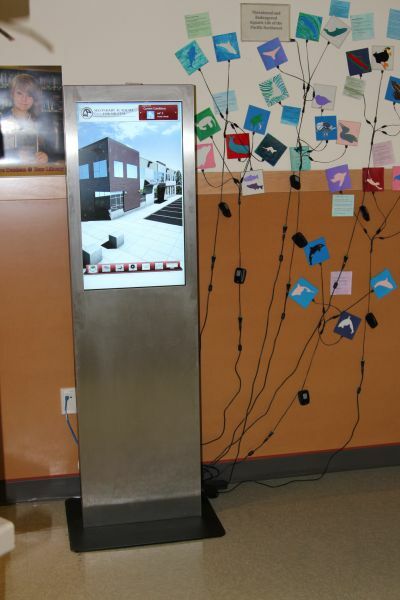 The first is awareness, which is accomplished by installing dashboard displays in common areas throughout the schools. These dashboards come in the form of big-screen televisions that display current and comparative data, as well as smaller touchscreen stations that give statistics to each user who inquires. Interested users can also download software to their laptop and mobile device to track data. More portals and kiosks in common areas, and more users who download the tracking software to their computers, equate to greater awareness. Green dashboards can also introduce an element of competition. When competition is part of the efficiency process, buy-in tends to increase dramatically. For example, one school installed a green dashboard with an automatic system in one classroom and manual controls in a second. The second classroom was made aware of the automation, and out-performed the conservation efforts of the students in the automated classroom where the utility systems shut down when the room was not occupied. Key discovery here is that the manual system worked best, but awareness and competition were significant contributing factors. Another powerful aspect of green dashboards in education facilities is habituation. Steps taken to teach students to conserve energy at a young age help create learned behaviors that will affect their everyday lives. These learned behaviors can develop into habits students will apply beyond school and for years to come. Although green dashboards are becoming more popular in educational facilities, the private sector is slow to integrate this technology, often because of the cost associated with metering systems. One exception is the Bullitt Foundation’s new headquarters in Seattle’s Capitol Hill neighborhood. Staffers have real-time utility usage and sustainability information available at their workstations and throughout the building, and this helps them to modify their behaviors in order to help the building operate at peak efficiency. A new energy code being adopted at the state and local level this summer will require all new buildings and any existing buildings going through a major remodel to have detailed metering systems in order to monitor and record the building’s energy use. Dashboard systems could soon become a fixture in the lobbies of office, commercial and apartment buildings. Important factors to consider when integrating green dashboards into new and existing buildings include making them accessible and user-friendly while educating tenants and encouraging competition. With these factors in place, green dashboards can and will become an integral part of reducing the environmental footprint of the built environment. Steven Lee is designer and senior project manager at the Seattle-based design firm Studio Meng Strazzara.